Tonala, Chiapas, Mexico – Oscar Omar Nunez, a 37-year-old street vendor, said in Honduras you have to pay to work. Extortion and death threats make even the sidewalk business in some neighbourhoods dangerous and expensive, he said. That’s why Nunez along with his wife and their three children fled Honduras more than a week ago. The family travelled with one of Nunez’s brothers, a sister, three nephews and his brother-in-law. They eventually caught up with an initial wave of thousands of US-bound Honduran refugees and migrants fleeing violence and unemployment. There is no work in Honduras, and the insecurity and violence is overwhelming, according to Nunez. He knows it is not going to be easy to cross the one border left on their journey, but he, like many in the caravan, feel they have no other choice, even as US President Donald Trump ramps up his threats against the group. As the vast majority of Hondurans in southern Mexico set up camp in Pijijiapan, Tonala and Arriaga on Thursday night, news began to surface that the White House was considering using an executive order that would restrict the Honduran migrants and refugees from entering the US. The plan is under consideration, according to US media, who cited unnamed officials familiar with the proposal. The Trump administration also reportedly requested the US military to deploy hundreds of troops to the US-Mexico border. The Wall Street Journal reported on Friday that Secretary of Defense James Mattis approved that request, though details about the number and role of the troops were not disclosed. Amid the threats from the US, Mexico and Central American countries have fortified their borders and put up additional roadblocks on the routes the migrants and refugees normally take. Honduran human rights activist Yessica Trinidad told Al Jazeera that the reactions to Hondurans fleeing en masse by the US and regional governments are misleading and overblown. Hundreds of Central Americans, including Hondurans, leave their countries to head to the US every single day, she said in a telephone interview. “This is not anything new. It is something that has been going on, because the government of Honduras has not fulfilled one of its main responsibilities, which is that the people of Honduras live in conditions with dignity,” said Trinidad, coordinator of the Honduran Network of Women Human Rights Defenders. “What is happening now and what creates such an impact is the quantity of people all together,” she said. Smaller groups of Honduran migrants and refugees continue to travel through Guatemala, but an estimated 7,000 are already in Mexico, heading north through the state of Chiapas. There were piles of clothing on tables around the gazebo in the Tonala central plaza, water was across the street in front of the municipal office building, nurses and other Chiapas state health workers had set up. Municipal police had cordoned off two blocks of the street between the town plaza and municipal government building. “Since four days ago, we have been preparing everything,” said Eduardo Thomas Gordillo, second in command of the Tonala volunteer firefighters. He paused for a few seconds as a woman on a loudspeaker, told the groups there that a clown show for children would be starting soon. She added later that men could line up behind the gazebo for free haircuts. “The truth is it is sad to see that people have to leave their homes and families to seek well-being. As firefighters we have always supported the lives of people. We do this wholeheartedly,” Gordillo tells Al Jazeera. Some Hondurans rested under tarps set up in green spaces in the Tonala plaza, and others ate food prepared by volunteers. Nunez’s 13-year-old son played with his five-year-old brother and other kids rode one of two little merry-go-rounds at one edge of the plaza. There are only two international borders between Honduras and Mexico, but Nunez and his family had to make three border crossings to get here. Al Jazeera first met the family last week in Esquipulas, Guatemala after they had crossed into Guatemala for the second time. Before then, they had made it by bus and on foot to the Agua Caliente border, the main crossing between Honduras and Guatemala. There, Honduran police blocked Hondurans hoping to join the caravan, so Nunez and his family hiked around it. They were stopped by Guatemalan authorities the next day, however, and were taken back to Honduras. Preventing people from leaving their own country and by informally deporting people whose lives may be at risk at home are both violations of international law, Amnesty International researcher Madeleine Penman told Al Jazeera earlier this week. Nunez and his family hiked around the Agua Caliente crossing into Guatemala through the bush for the second time. Then, travelling through Guatemala with more than 1,000 people, they were able to make it through checkpoints. Like thousands of others, Nunez and his family took rafts to cross the Suchiate River into Mexico, eventually catching up with the initial wave of the caravan earlier this week. The family is still more than 1,500km from the US border, and they, like many in the group, have only heard bits and pieces of the news about how Trump plans to stop them. Nunez dismissed Trump’s remarks about Middle Easterners and criminals infiltrating the caravan. Everyone here on the ground knows that is not true, he said. 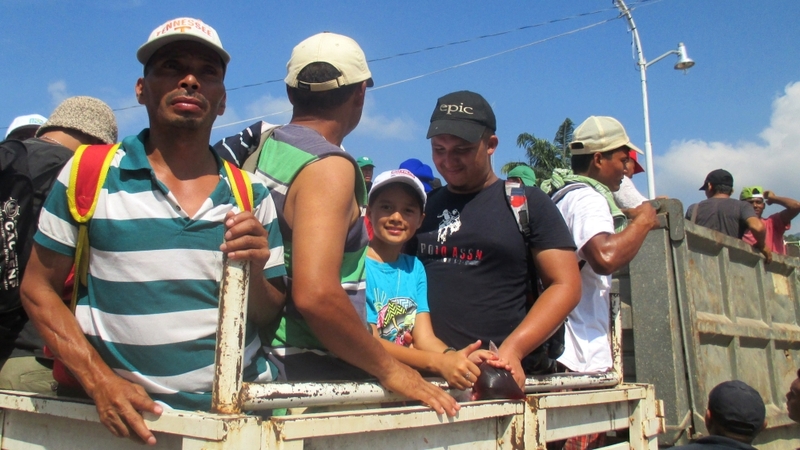 On Friday morning, the Nunez family, along with hundreds who spent the night in Tonala, lined up to get into trucks to take them 25km up the highway to Arriaga, where thousands will spend the night. “Thank you Tonala!” Hondurans shout out from the back of a truck, waving as they take off to their next stop.